The Quad is located at the heart of Auckland Airport’s business district and is rapidly becoming a vibrant commercial hub. Already a home to airlines and support services, there are now a hotel, offices and retail buildings being developed alongside. Quad 5 is a four storey office building with retail area and gymnasium on the ground floor. 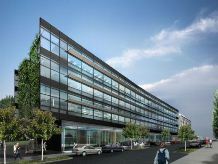 The Jasmax designed building is a five star Green Star-rated structure located on the re-aligned Leonard Issit Drive. Auckland Airport occupy 1750 sq m of new offices on the first floor and the two floors above contain a further 2200 sq m of commercial space. The electrical contractor requested Intelligent Environments Ltd to take responsibility for the supply and installation of the lighting control system for this new office complex. As part of the commitment to energy savings, the system includes daylight harvesting (allowing artificial lighting to dim down or turn off when sufficient natural daylight is available), plus presence and absence detection throughout, to ensure lighting switches off when areas are unoccupied.